The Steam Item Store is a customizable Steam-hosted web store for selling items defined in the Steam Inventory Service. If you have items defined with prices in the Steam Inventory Service, then you can simply enable the Item Store to have a place that lists your purchasable items. Once enabled for your Steamworks game, this store will provide a set of web pages hosted by Steam that lists out the priced items you’ve defined in the Steam Inventory Service for your game. Through these pages, customers can browse, filter, and search through the available items for the game, add them to a cart within your store, and purchase using the Steam Wallet. You'll need to start by having a functional Steam Inventory Service implementation. Once you've configured your Inventory Service and have defined at least one item that have prices defined, then you can enable the Steam Item Store for your application. Make sure Inventory Service is enabled for your app. See Steam Inventory Service for details. Then go to the 'Edit Store' section for your app and find the Item Store tab. Check the box to enable your Item Store. There are a few ways you can customize your store (see below for details), but they are all optional. Once enabled for your own game, you can easily open your Item Store page from within your game by launching the Steam Overlay and passing it this page’s URL. Or you can link to this page from your own website or store page. Your top-selling items will even automatically appear on your base game’s store page to help customers find your items. We’ve made it easy to customize your store with a background image as well as options for a grid or list view and the ability to define tags that can appear as tabs to be used to filters for the items shown. 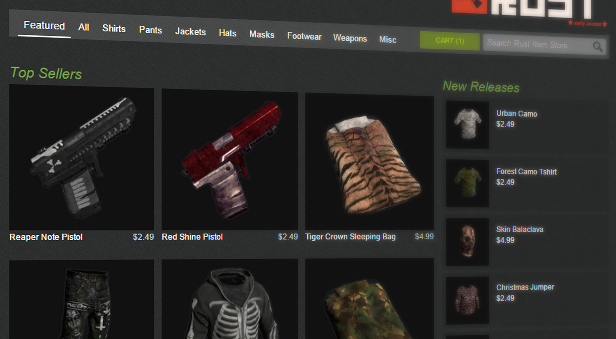 As an example, you can see in the screenshot above that the developers of Rust have customized their Steam Item Store page with a custom background and tabs for easily finding different types of items. You can enter a name for your store and localized versions of that name for display in different languages. If left blank, we'll just show your app name as the name. You can pick whether to show items in a grid or in a list. You can upload a custom background image, which includes your product branding if you wish to change the overall feel of the store. This image should be 1920px x 1080px and the edges should fade to a solid background color which you can also specify. You can associate a top-level filter with one or more tags, which are delimited by the ";" character. Tags are specified in the item definition schema in the store_tags field in your Steam Inventory Service ItemDefs. You can display additional images on the detail page for an item by specifying them in the store_images field in your Steam Inventory Service ItemDefs. See Steam Inventory Service schema.